One of my early posts here at Patty Cake’s Pantry was about menu planning and deciding what you should store in your pantry. In that post, I mentioned that because of the temperature extremes in the area where I live, we basically have two menu plans. One for hot weather and one for cold weather. July is traditionally the hottest month of the year in this area with temperatures frequently over 100 degrees F. This means that our summer menu is in full swing. During the hot summer months, we frequently cook outside on our grill and limit how much cooking is done in the house. This week, we have been lazy and have been grilling sausages and hot dogs instead of anything more complicated. Since I am concerned about my family’s nutrition, I can’t let them eat hot dogs with nothing else. They need their fruits and vegetables. This is something that is often debated. Conversations go something like this. No, Honey, ketchup is not a vegetable. Yes, it’s made from tomatoes but it’s not a vegetable. I know that for school lunches it was considered a vegetable. I don’t agree. Eat a tomato and it’ll count. The fruit thing is easy to provide during summer. Simply slice up a chilled watermelon. They are guaranteed to eat at least two servings of fruit at a single setting. Vegetables can be a bit more tricky to get them to eat. Today’s recipe was born out of a need to provide a vegetable side dish that my family would eat. Granted, it has a very strange name, but my husband says it’s so named because “It’s the best!” He says this in his best impersonation of an exuberant 1970’s game show host. He cracks me up. While this recipe is very good, and I really like it, I am not so vain as to claim that it’s the best. In my experience, people have very different opinions of what makes a good coleslaw. My mother preferred a simple vinegar and mayonnaise dressing with a little salt on her coleslaw, and so did her mother. My paternal grandmother liked her coleslaw dressed with a combination of mayonnaise, vinegar, sugar, salt, and pepper. My father didn’t really seem to have a preference until a fish and chips shop opened in the small town where we lived. Their coleslaw was creamy, vinegary, and it had a unique taste that came from the addition of celery seeds. What followed were weeks of experimentation while my mother attempted to perfect this coleslaw dressing. My mother would always try to figure out how to make anything that we told her we liked. The other ingredients in coleslaw are often varied as well. Some people are purists. They like only cabbage in their coleslaw. Others add carrots, green onions, red onions. I even know a lady who puts crushed pineapple into her coleslaw. It’s like I said before. What constitutes a good coleslaw seems to be largely related to personal preference. For this recipe, I decided to make my slaw dressing out of a combination of everyone’s recipes. I used mayonnaise, red wine vinegar, sugar and celery seed. I got lazy for the vegetables though. I just picked up a bag of coleslaw mix and some sliced green onions. My rationale for doing this was actually based upon cost rather than ease of preparation. When I was in the store, the bag of coleslaw mix was cheaper than buying a head of cabbage and some carrots. I made a few changes to improve the nutritional content of the recipe. By using the pre-cooked and pre-chopped bacon instead of regular bacon, I shaved off 80 calories and 5 grams of fat from the total recipe. By switching out regular mayonnaise for canola mayonnaise, I shaved a total of 800 more calories off of the entire bowl of coleslaw. In addition, the canola mayonnaise provides 18% of our daily omega 3s in just one tablespoon. They were simple swaps that improved nutrition without sacrificing flavor. It’s still not the healthiest dish on the planet, but it’s a little healthier with these changes. Do you want to know why I called it the BST coleslaw? It’s because I added bacon, sunflower seeds, and tomatoes. I really liked it, and I hope you do, too. As always thanks for visiting my site. This coleslaw is made better by the addition of bacon, sunflower kernels, and tomatoes. Put mayonnaise, vinegar, celery seed and sugar into a bowl and mix to combine and make the dressing. 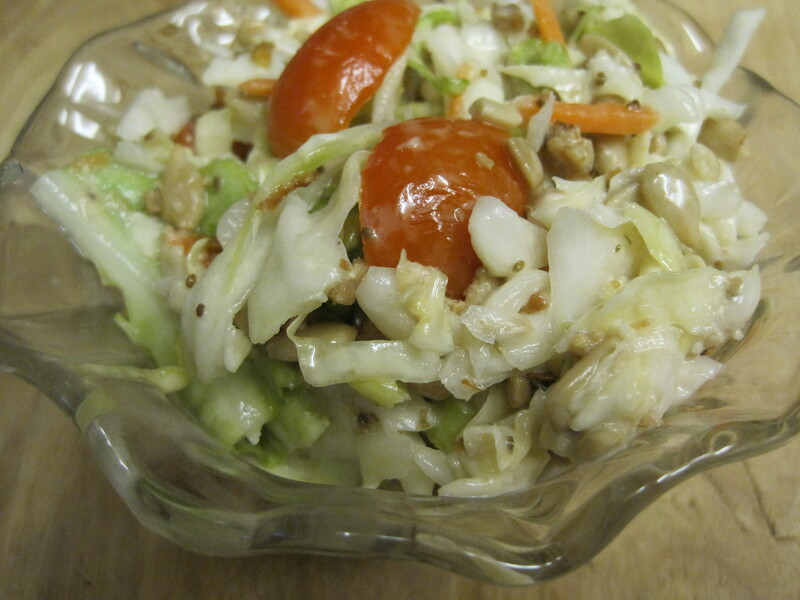 Put cabbage and carrots (or coleslaw mix) into a bowl with sunflower kernels, and bacon. Pour dressing over salad and mix until well combined. Cover and refrigerate for at least one hour before serving to allow flavors to combine.